Our support to TB control in Nigeria is the largest KNCV/Challenge TB project in Africa. The Honorable Minister of Health, Prof. I.F Adewole, the State Minister of Health, Dr.E.O. Ehiamire, and the Permanent Secretary Ministry of Health, Dr. Amina Shamaki, met with representatives from USAID, NTBLCP and KNCV on 12 January 2016. On 12 January KNCV Tuberculosis Foundation Executive Director Kitty van Weezenbeek and Challenge TB Director Maarten van Cleeff paid a courtesy visit to the Federal Ministry of Health in Abuja, Nigeria. Our support to tuberculosis (TB) control in Nigeria is the largest KNCV/Challenge TB project in Africa. The project is currently expanding support from 12 to 15 states, and decentralizing the support from national level coordination to 3 regional offices with presence of KNCV staff in all 15 states. 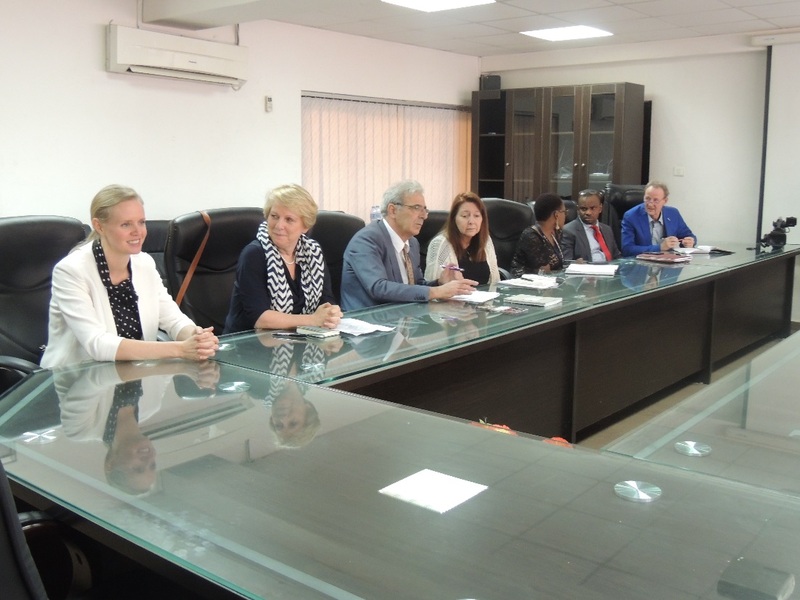 Dr. Kitty van Weezenbeek congratulated the Honorable Minister of Health Prof. I.F Adewole on Nigeria’s achievements in successfully tackling Ebola and Polio. She then highlighted the challenge of TB in the country, indicating that Nigeria ranks 4th among the 22 high TB burden countries, and 1st in Africa in drug-resistant TB, with an MDR-TB burden of about 20,000 new patients per year. 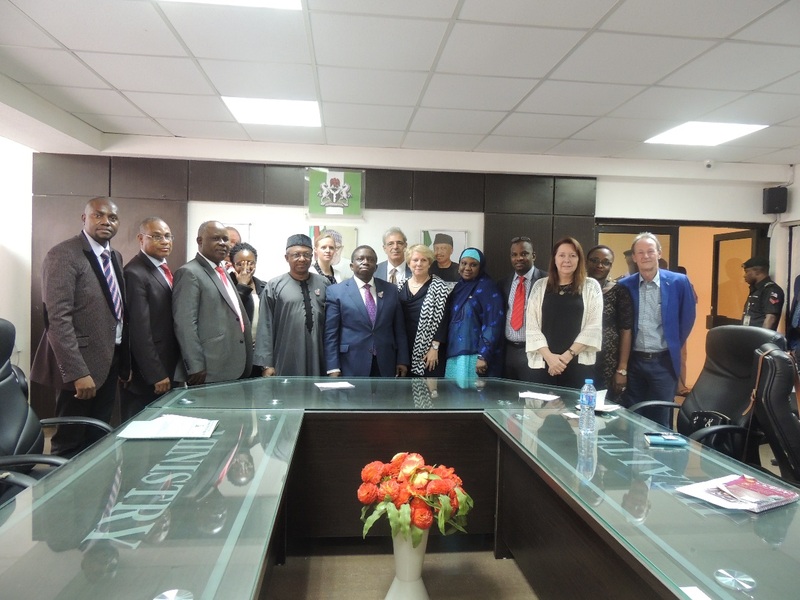 Dr. Maarten van Cleeff affirmed Challenge TB’s continued support for Nigeria’s TB control, especially in improving case detection rates at the primary health care level. He highlighted the need for federal government commitment and resource mobilization; greater awareness of the TB situation among Nigerian policy makers and the need to place it on the top agenda at both the state and local levels. The TB/HIV team leader at USAID, Kelly Badiane, emphasized the importance of having a TB platform to help strengthen the Primary Health Care level in Nigeria. The Honorable Minister asserted his support for the Challenge TB project. He appreciated the efforts of the different partners and expressed his willingness to work together with the National TB and Leprosy Control Program (NTBLCP) and KNCV/Challenge TB. The Minister promised to liaise with relevant people in regards to converting Lagos Mainland Hospital back to an MDR-TB facility. The former MDR-TB ward was utilized for the control of Ebola outbreak in 2014/2015. He also confirmed his support for the World TB day in March 2016 and requested the NTBLCP to submit an agenda for the latter to the ministry. 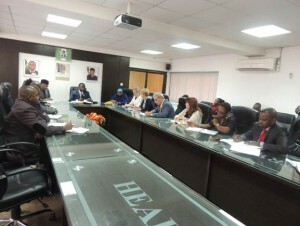 The meeting was a huge success, as Prof. I.F Adewole promised to liaise with various commissioners and state governors about promoting the utilization of the primary health care and as such the discussion would include creating an awareness around tuberculosis.